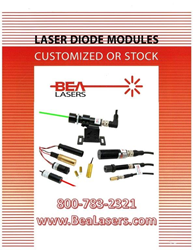 BEA Lasers, a manufacturer of rugged industrial laser modules and assemblies, has announced the availability of its new catalog, detailing their complete standard product line for use in leveling and alignment applications. In addition to the catalog, BEA Lasers has also just launched its new website, which can be viewed at http://www.bealasers.com. This new catalog will assist in the selection of industrial lasers, modules and assemblies. All standard items shown in the catalog are available for immediate shipment. However, any standard laser product can also be modified to suit a customer’s need, and custom lasers and laser assemblies are also available. Laser parameters and criteria are listed in the new catalog for custom laser products, which are suitable for custom OEM applications. For more information on BEA Lasers, please visit: http://www.bealasers.com.